It fittingly re-starts with a Southfork gusher that showers the already oily only son of J.R. Ewing with high-priced Texas tea. Some said it couldn't be done. Others argued it shouldn't be done. But it's a done deal. TNT's 21st century brand of Dallas swaggers into view Wednesday night with back-to-back episodes subtitled "Changing of the Guard' and "Hedging Your Bets." The grand ol' soap opera that fueled CBS from April 2, 1978 to May 3, 1991 returns with no need to apologize. TNT, Warner Horizon Television and executive producers Cynthia Cidre and Michael M. Robin have put together another broadly entertaining, handsomely produced, chicanery-filled Big Gulp of Big D. But it'd all be little more than a dry hole without the active participation of three Southfork essentials returning to the scene of their shrine. 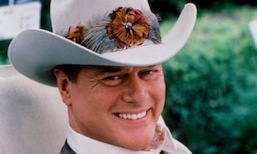 Larry Hagman, 80, is still the ungodly J.R. Ewing. Patrick Duffy, 63, remains goodly as his brother Bobby. And Linda Gray, 71, has gladly traded in her besotted, victimized version of Sue Ellen for a new and confident model with a run for governor just down the road. That's way too much Matlock for most networks. But TNT very wisely has given all of them much more to do than walk throughs. Those are left for the likes of Dallas alums Ken Kercheval, Charlene Tilton and Steve Kanaly. Much more is expected -- and delivered -- from the so-called "Big Three." Duffy's the workhorse. TNT made seven of Season One's 10 episodes available for review. And Duffy's Bobby is on camera every bit as much as the five principal newcomers -- three of them veterans of Desperate Housewives -- who join the show's elders as bait for younger viewers. Bobby provides the opening episode's shock value in his first scene. Let's just say he'll be in the throes of a major health scare while also battling the ever-embittered John Ross Ewing (Josh Henderson from Desperate Housewives) for the future direction of Southfork. John Ross wants to drill, baby, drill with the initial support of girlfriend Elena Ramos (Jordana Brewster). She's the daughter of the Ewings' Hispanic cook, Carmen (Marlene Forte), and ex-fiancee of Bobby's adopted son, Christopher (Jesse Metcale from Desperate Housewives). Bobby, happily married to his third wife, Ann (Brenda Strong from Desperate Housewives), is hell-bent (in a good way, of course) on upholding his sainted late momma's "no drilling on Southfork" edict. He also yearns to end a generation of Ewing dysfunction, underscored in his first scene with a clinically depressed, J.R., who's first seen in a well-appoined nursing home. "I worry about Christopher and John Ross . . . I don't want them to be like us," Bobby says measuredly to an unresponsive J.R. "But all that being said, I do miss you." It's an effective and galvanizing scene, rekindling the old, ringing in the new and setting the stage for those inevitable Bobby-John Ross fireworks once it's learned that Southfork has been violated anew. The fifth new cast member, Julie Gonzalo from Veronica Mars, plays Christopher's new fiancee, Rebecca Sutter. But all's not what it seems with her. Ditto for the beauteous Marta Del Sol (Leonor Varela), who promises Bobby that under her conservancy, Southfork's "vast, exquisite, scenic views will be protected forever." J.R. eventually rouses himself, as you knew he would, to reclaim his rightful place as the Lord Dastardly of Dallas. His first speaking lines arrive more than halfway through the opening episode. But they're almost electric. And comical, too. Bad seed John Ross, who had been estranged from his daddy, visits the old sidewinder to whine about Bobby's blocking of his plans. A mute J.R. soaks it all in before at last loosening his tongue. "Bobby was always a fool," he tells the boy. "Stubborn as a mule. And particularly harebrained about that foundling, Christopher. Not even a Ewing." Bobby's impulsive solution is to sell Southfork and help fund son Christopher's clean energy alternative -- hydrate mining of methane. But nothing goes smoothly on Dallas, where only Bobby fully swears by handshake promises and getting even via honorable means. The first seven episodes are replete with John Ross's trumpeting of his "birthright," Bobby's momma's boy preachments and J.R.'s close-ups just before commercial breaks. Whether brandishing his trademark chortle or simply setting his jaw, Hagman shows that getting back on this bicycle is still a snap for him. He also fires off some fine lines. Episode 1: "Son, the courts are for amateurs and the faint of heart." Episode 2: "And son, never pass up a good chance to shut up." Episode 3: "I'll be there when they put you in the ground, Barnes. Listen close, I'll be the one dancin' on the dirt overhead." Also in Episode 3: "Bullets don't seem to have much of an effect on me, darlin'." It's all in the service of J.R.'s overriding game of thrones. When it comes to a certain big parcel of prime Texas turf, "I'm the one who belongs on Southfork. It's mine -- and only mine." Barbara Bel Geddes and Jim Davis are deceased, and Victoria Principal so far is not participating. Otherwise they're all back. In the annals of the original Dallas, only one sports team really mattered to J.R. and his cronies. A world championship season by the Dallas Mavericks and back-to-back World Series appearances by the Texas Rangers haven't changed that. They're unmentioned in the first seven episodes while the comparatively inept Dallas Cowboys again are referenced or spotlighted. In Wednesday's first episode, a grizzled conspirator in John Ross's secret oil digging notes that "Bettin' against J.R.'s son would have been like bettin' against the Dallas Cowboys,. Downright unpatriotic." That same episode ends with a completely concocted meeting of two conspirators on the 50 yard line at Cowboys Stadium. And in Episode 5, J.R. makes a showy appearance in owner Jerry Jones' stadium box, where the real JJ treats him like a knight in shining armor despite his long history of screwing people. "Good to have you back in form, J.R.," Jerry tells him before the evergreen double dealer is serenaded by the PA announcer: "Jerry Jones and the Cowboys organization is proud to welcome J.R. Ewing to the Cowboys Stadium. Let's all give him a bit Texas-size welcome." J.R. grins and waves in the company of son John Ross while coach Jason Garrett claps and receiver Dez Bryant gives him a little high sign. But both of those gestures clearly are the product of stock footage in which Garrett in fact was exhorting his team while Dez was just being Dez. Good theater, though. Of the newcomers, Strong as Bobby's devoted wife is a clear standout. She's somewhat reminiscent of Connie Britton in NBC's Friday Night Lights -- a loyal partner whom you'd better not cross. Ann Ewing is made of sturdy stuff, but also has a secret back story that reduces her to copious tears in a later episode. No one is ever home free on Dallas. The kids are all right, too. Henderson has a knack for simmering, burning and blowing up as the prodigal John Ross. He means to get even but also knows the score, telling his daddy in Episode 3, "I don't blame ya for tryin' to screw me." Metcalfe's Christopher is prettier than his cousin, and with a harder role to navigate. Being Bobby's son requires him to walk a vanilla brick road at times. But the character can't be a pushover and must know how to play hardball. Christopher's confrontations with John Ross -- and occasionally with his father -- are for the most part well-played. "Stop protecting me like I'm a little boy!" he rages in Episode 3. That's the spirit. Gonzalo as Christopher's bride-to-be is torn between duplicity, fidelity and her growing bond with Bobby's supportive wife. The noticeable scar on the bridge of her nose seems to grow deeper the more vexed she is. It's her equivalent of a furrowed brow. And by Episode 7, her major new development promises to drive the story line almost as much as the war over oil and pristine Southfork land. Brewster, as the cook's daughter, battles insecurities while fending off or accepting the advances of both John Ross and Christopher. While despairing of trusting anyone, she forges an alliance with Sue Ellen Ewing, the onetime drunken dependent who now has the ways and means to make her own power plays. Gray's Sue Ellen is the least-seen of the "Big Three." But she makes her scenes count, whether presiding over the annual Cattle Baron's Ball (staged in Victory Plaza) or propping up John Ross in his times of need. Gray and Hagman briefly flash their old Dallas magic at the Cattle Baron's Ball, where he discards a walker and ambles up to her as part of his faux apology tour. "You won, honey. And I couldn't be happier," he says. "You're still the prettiest gal at the ball." Sue Ellen has grown too old and wizened to entirely fall for that. Still, she clearly appreciates the sentiment in a scene that should be bottled and preserved. It also should be noted that even the Ewings' feisty Latina cook gets a few lines on occasion, even if one of them is "Mr. Bobby." In the original series, the Hispanic help was seen but not heard. The new Dallas otherwise has as many preposterous plot twists as the old one. Everyone has an agenda, with even Bobby initially keeping secrets, albeit for what he sees as the greater good. In the grand scheme of things, perhaps a few of these schemes could have been left on the cutting room floor. On the other hand, Dallas has always been a bodacious prime-time version of a more budget-conscious daytime soap. So maybe restraint just ain't gonna cut it. Whether all of this means another long run for Dallas is anyone's guess on the eve of its heavily promoted return. 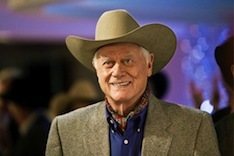 Hagman, for one, just may not be up to that. And his subtraction would be akin to eliminating the devil from Damn Yankees. In the here and now, though, TNT's brighter, shinier Dallas makes an impressively staged re-entrance Wednesday night. Its signature opening theme is intact amid some changed scenery that now includes glimpses of Cowboys Stadium, the downtown Omni hotel, a DART train and the Margaret Hunt Hill Bridge. But the show's namesake city still comes off as a synonym for greed and trickery. Back in the early days of Dallas, this imagery constituted a problem for some city leaders. But then the money started flowing in while the world began seeing Dallas as the home of the Ewings rather than the site of Kennedy assassination. Thirty-four years after Dallas premiered on CBS and 21 years after the series ended, it's all coming back home again. And the elemental dynamics between the series' Cain and Abel remain for all to see. "You wanna carry on mama's legacy? Well, I wanna carry on daddy's," J.R. informs Bobby after out-witting him in Episode 5. "I'm gonna make this right," vows Bobby. "And I'm going to take you down -- brother."